Part Used : Bark, Leaves, Tender Shoots, Latex, Seeds, Fruits. Habitat : Found throughout india and also cultivated. Uses : The bark is cooling and astringent and is useful in inflammations and glandular swellings of neck. Root bark is good for stomatitis, clean ulcers and it is astringent in leucorrhoea and promotes granulations. According to Unani system of medicine, root, bark is and also good for lumbago. Roots are said to be good for gout. The roots are chewed to prevent gum disease. The fruit is laxative, promotes digestion, and checks vomiting. Ripe fruits are alexipharmic (an antidote or defensive remedy against poison, venom or infection), are good for foul taste, thirst and heart disease. The powdered fruit is taken for asthma. The seeds are cooling, laxative and refrigerant. Seeds are useful in urinary troubles. 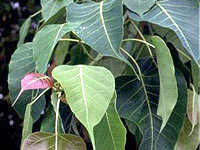 The leaves alone are used to treat constipation. The leaves and young shoots together are purgative (strong laxative). An infusion or decoction of the bark is used with some honey for the treatment of gonorrhoea, ulcers, skin diseases and scabies. Its power bark has been used to heal the wounds for years.